[ London. ] Dated at head 'February 13th. A.D. 1890'. 3pp., 4to. Bifolium. Folded in customary fashion, with 'Brief | for the opinion of Mr Harington' on the outside of the packet, beneath which, in another hand: 'Feby 14th. 1890 | Richard Harington Esq'. The author's hand is clearly disguised, as is usual with valentines, the writing being markedly ornate. There are various crude drawings in the margins, ranging from images of a barrister and a woman, faces of two women (one smoking a pipe), to small representations of cigar boxes, briefs and books. [Elegantly headed Notepaper] Queen Anne's Typewriting. Shorthand Translating Office., St Stephen's Chambers, Telegraph Street, EC, 16 Feb. 1917 to 25 Sept. 1919. Total 5pp., 8vo, good condition. She initially (16 Feb. 1917) asks for "a further supply of the Invitation Cards" hoping he'll send the with a "proof". (17 Feb) she acknowledges receipt of a book of tickets and returns corrected proofs. In later letters she exchanges courtesies with brevity. Note (via Google: JTA): "Mrs. Constance Hoster, a leader in women’s work, died yesterday at the age of 74. She was a pioneer in the training of women for secretarial and other positions and was one of the first women to be elected to the London Chamber of Commerce. She was the daughter of Dr.
[ Richard Oastler, factory reformer. ] Autograph Letter Signed to his daughter Maria, wishing her a happy new year from the Fleet Prison, and describing the meal he has eaten there. 1p., 4to. In fair condition, on aged and worn paper, with slight damage to corners caused by removal from album. For the context of the letter, see Oastler's entry in the Oxford DNB, which explains that he was nearing the end of a three and a half year sentence at the Fleet Prison, for 'debts accumulated during his stewardship at Fixby', the charge being a 'Pretext', his 'campaign against the new poor law' having proved 'incendiary'. The letter begins: 'Maria! | This comes from thy own Papa, to wish thee a Happy new Year. [ Pamphlet. ] The Facts about the Unemployed. An Appeal and a Warning. By One of the Middle Class. London: The Modern Press, 13, Paternoster Row, E.C. and W. L. Rosenberg, 261, East Tenth Street, New York City. 1886. 16pp., 12mo. Disbound without covers. In fair condition, on lightly-aged paper. Signed in type at the end 'H. H. C.' At foot of reverse of title: 'The Writer will be glad to hear from anyone who agrees with his conclusions.' Scarce. [ Pamphlet. ] Dangerous Trades for Women. The Humanitarian League's Publications. No. 9. London: William Reeves, 185, Fleet Street, E.C. 1893. 22 + pp., 12mo. Disbound and without covers. In good condition, on aged paper. The last two pages advertise the Humanitarian League, including a page of publications. Scarce. For more on Mallet, see her entry in the Oxford DNB. [ Pamphlet. ] The Position of the Agricultural Labourer in the Past and in the Future. By an Agricultural Labourer. [Printed British civil service paper.] Open Competition for registration as Boy Copyist (New Class) in the Civil Service, August, 1898. Regulations, Examination Papers, and Table of Marks. 'Civil Service Commission. [All Rights Reserved.]' London: Printed for Her Majesty's Stationery Office, by Eyre and Spottiswoode, Printers to the Queen's Most Excellent Majesty. 1898. 24pp., foolscap 8vo. With 3pp. of lithographed plates ('Copying MS.') between pp.6 and 7, giving two examples of uncorrected manuscripts for the contestants to copy out. Stitched and unbound. On aged paper, with the first and last leaves and fore-edges of plates worn and chipped at extremities. Divided into three sections: 'Regulations, &c.', 'Examination Papers' and 'Table of Marks'. [Printed pamphlet.] Association of Technical Institutions. Paper read at the Annual General Meeting, Friday, 26th February, and Saturday, 27th February, 1937, on "Some Aspects of Education for the Printing Trades". 21pp., 8vo. In beige printed wraps. In good condition, on lightly aged paper, with slightly rusted staples, in worn and chipped wraps. With shelfmarks, stamp and label of the Board of Education Reference Library, London. [Printed parliamentary paper.] Employment of School Children Committee. Report of the Inter-Departmental Committee on the Employment of School Children, appointed by H.M. Principal Secretary of State for the Home Department [Chas. T. Ritchie]. Presented to both Houses of Parliament by Command of His Majesty. London: Printed for His Majesty's Stationery Office, by Wyman and Sons, Limited, Fetter Lane, E.C. 1901. 25pp., foolscap 8vo. Stitched. On worn and aged paper. With shelfmark, stamp and label of the Board of Education Reference Library, London. Title-page headed in manuscript: 'OUT OF PRINT'. [An young English Quaker relief worker in Germany.] Seven Autograph Letters Signed from 'David' [to the Tennant family? ], describing in vivid terms his work in Lower Saxony (Harzburg, HIldersheim, Goslar) in the aftermath of the Second World War. The first five from 124 Friends Relief Section [or 'Service'] (Quakers), B.A.O.R. [British Army of the Rhine]; the sixth letter from 17 Friends Relief Section; seventh from Work-Camp at Hildesheim,. Between March and July 1947. 66pp., 12mo. In very good condition, on lightly-aged paper, each of the letters kept together with rusty staples. All the letters are signed 'David' and addressed to 'My Dear All'. Accompanying them is an envelope addressed in another hand to S. W. J. Tennant, Beechcote, Brands Hill Avenue, High Wycombe, and this may provide a clue to the identity of the recipients, to whom 'David' makes it clear on a couple of occasions that he is not related, signing off one letter 'from your muddle-headed friend'. 81 items of personal correspondence of the social worker and founder of youth clubs Sir Basil Henriques, consisting of Autograph Letters Signed by him from childhood into early manhood, and a number of letters to him, mainly from his family. Mainly dating from between 1899 and 1915, with the latest item from 1939. Sir Basil Henriques was born in London on 17 October 1890, the youngest of the five children of David Quixano Henriques (1851-1912), whose family, originally Sephardi Jews from Portugal, owned a substantial import and export business, first in Jamaica, and then in Manchester and London, and his wife Agnes (née Lucas; 1849-1919), a great-niece of Sir Moses H. Montefiore. Basil was educated, first, under the headmaster the Rev. Edgar Stogdon (1870-1951) at Elstree preparatory school, and then, from 1904 to 1907, at Harrow. Typed Letter Signed ('A J Sylvester') from Lloyd George's private secretary A. J. Sylvester [Albert James Sylvester] to Sir Charles Starmer, regarding 'Mr. Lloyd George's visit to Cober Hill Guest House'. With copy of Starmer's typed letter. Thames House, Millbank, SW1. On House of Commons letterhead. 12 May 1933. Copy of Starmer's reply dated the same day. Both Sylvester's letter and the copy of the letter by Starmer to which it is replying are in good condition, on lightly-aged paper, each with punch holes to one margin. Starmer, who at the time of writiing was proprietor of a large group of newspapers, had begun his career on the 'Northern Echo'; he had for many years been a Liberal member of parliament, standing down in 1931 due to ill health. Cober Hill Guest House was at that time an early experiment in what would become the children's home or retreat. For clarity's sake this description begins with the copy of Starmer's letter: 1p., 4to. [Printed book.] Practical Instruction for Detectives. A Complete Course in Secret Service Study. By Emmerson W. Manning, Manning National Detective Institute. 94 + [i] pp. In original green cloth with title in black on front cover. Good, lightly-aged in lightly-worn and spotted binding. Ownership signature ('') in pencil on title-page, with pencil annotations throughout translating passages into French. Chapters on 'Shadowing', 'Burglaries', 'Identification of Criminals', 'Forgeries', 'Confessions', 'Murder Cases', 'Grafters', 'Detective Work in Department Stores', 'Railroad Detective Work', 'Detective Work for Street Railways', 'Other Kinds of Detective Work' (the last including 'Illegal Liquor selling'). 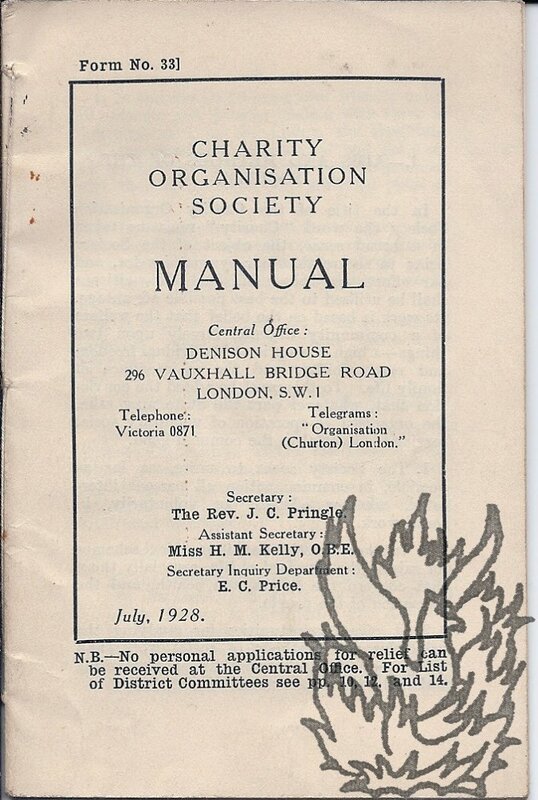 [Printed pamphlet containing detailed lists of charity and social work organisations in the Great Depression.] Charity Orginisation Society Manual. 16mo, 24 pp. Stitched. Text clear and complete. On aged and lightly-spotted paper. Topics, under nine headings, on pp.1-9, include the 'Aims and Methods' of the Society, constitution, 'Workers', 'Training for Social Work', 'Application for Help', 'Inquiry Department'. 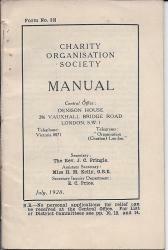 Pp.10-15 gives a list of different charity organisations in London, with names of officials, opening hours and other details. Pp.16-17 carry a list of borough offices of 'Metropolitan Mutual Registration of Assistance'. Pp.19-22 carries a 'List of District Committees and Offices. Printed Indenture of Apprenticeship, in two identical parts. [circa 1810] London: 'Sold by COLES, KNIGHT and DUNN, Stationers, No. 21, Fleet Street. Printed by W. SMITH, and Co. King Street, Seven Dials. A bifolium, with the text printed landscape on the recto of the two leaves, each of which are 21 x 33.5 cm. On laid Britannia paper watermarked 'G. PIKE | 1809'. The first two words in gothic script, nine-line marginal note in italic, and the rest in roman. Thirty-three lines of text, with spaces for manuscript insertions. Neither of the two parts (presumably one for the master and the other for the apprentice's family) has been filled in. Prepared for completion in the 1810s ('in the Year of our Lord 181[gap]').